Bard studied Economic Geography at The Stockholm School of Economics in the 1980s while building a highly successful international career as a songwriter and record producer. 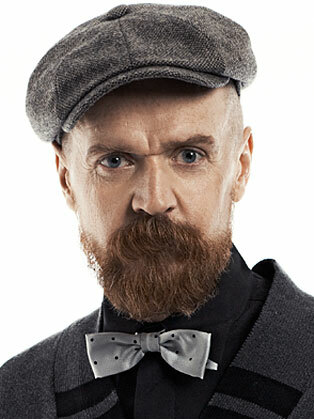 In 1992, he and his business partner Ola Håkansson co-founded Stockholm Records - which quickly achieved global success with bands like The Cardigans, A-Teens, and Bard’s own Army Of Lovers - which went on to become Scandinavia's biggest independent record company before it was sold to Universal Music in 1998. Even though he has claimed to be too busy with cyberphilosophy and political and spiritual activism to find the time for any more songwriting, Bard achieved No 1 hit records in Europe, Asia and North America as late as 2014. Never afraid of himself entering the stages on which he builds his groundbreaking theories, Bard has become (in)famous for his controversial television performances as a flamboyant star judge on Swedish Idol. Bard has given lectures on the philosophical, sociological, and economic implications of the Internet revolution at the Stockholm School of Economics and other academic institutions worldwide since the late 1990s. Throughout his career, he has been a fundamental force in creating the Swedish music export sensation - making Sweden the world's biggest per capita music exporter - and promoting a deeper understanding of the full dramatic effects of the information technology revolution (Sweden being the home of both The Pirate Movement and music streaming giant Spotify). Attentionalism: How Network Dynamics changes Business and Marketing as we know it - forever! The Art of Imploitation - how the value of information increases by NOT exploiting it!